Would you like to pass a few relaxing hours at the beach or lake and be optimally protected from sun, wind and annoying insects while you’re there? 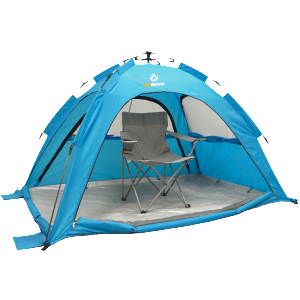 Then SunSnapper, our automatic, quick-set-up beach shelter with extra high UV 80 protection is an absolute must! Order the SunSnapper now in blue or green at Amazon. 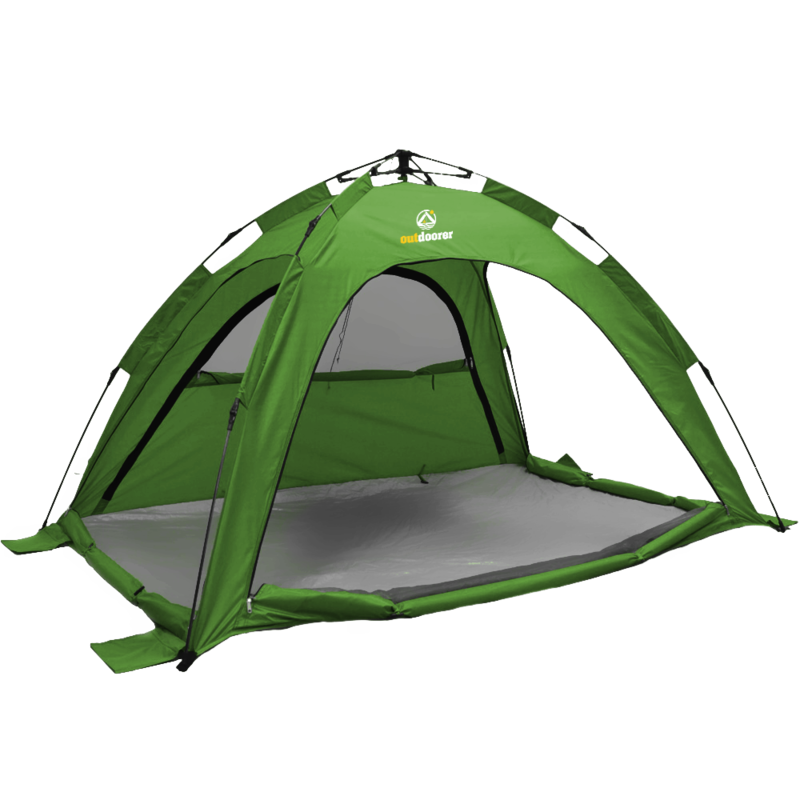 The big highlight of this special sun tent is the innovative Quick-up technique. This allows the tent to be set up automatically in seconds and with no effort. All you have to do is unpack the SunSnapper, spread the rods and pull two cords. Your sun tent is now up and you can make use of the sheltered space. 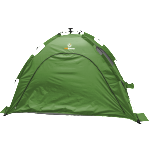 So that the tent has good traction, it can be fixed with the four supplied alupegs and/or alternatively, weighted down with the four sand bags. In very sandy soils, however, we recommend the use of special pegs. The v-shaped Sand Fortress sand pegs were developed by Outdoorer especially for optimal use on sandy bases. The tent can also be taken down in no time. 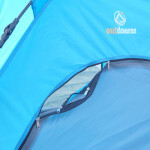 You just need to release the mechanism where the rods cross and the tent goes down. 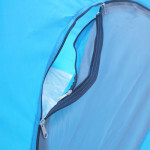 The rods are then folded together at the joints and the beach tent is packed in a practical carrying bag. To keep your skin well-protected from harmful UV rays, Outdoorer has created the SunSnapper out of its proprietary Lumotex 80 sunscreen fabric. 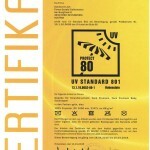 The Hohenstein Institute has awarded this its highest certificate, the 801 standard, for its UV 80 sun protection. Specifically, this means that your skin’s natural ability to protect itself will be increased 80 times in the shade of this sun tent. This wind-stable, extra-large beach tent offers plenty of space for two people. When set up, the Snapper is 120 cm high and thus also offers adults plenty of head room. 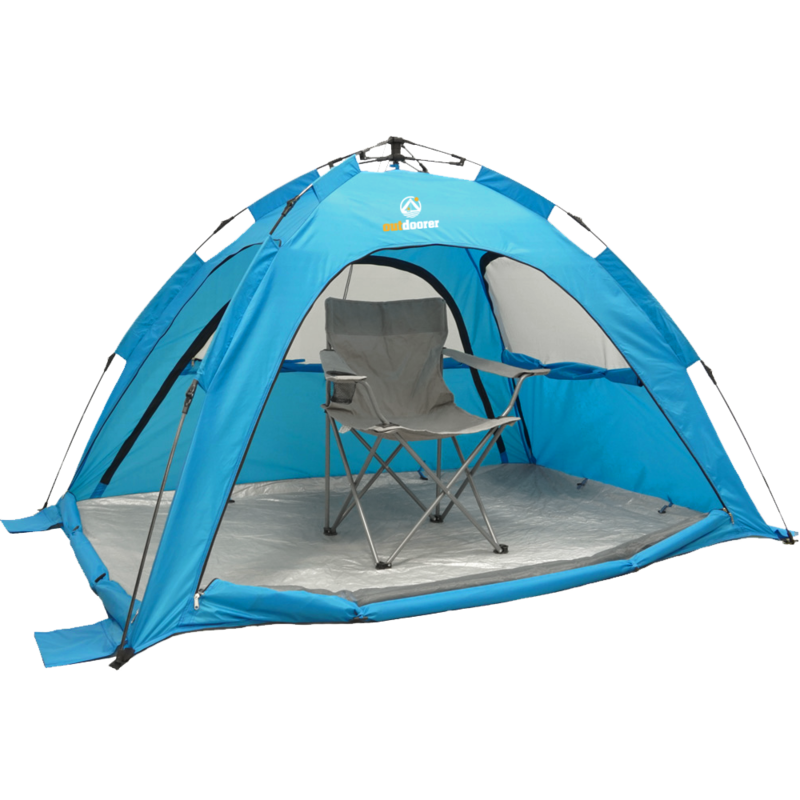 The centrally-mounted storage area in the tent’s ceiling area is especially practical – important items can stowed away here and still be ready to hand. On a warm summer night, it is also possible to use the SunSnapper as camping tent. 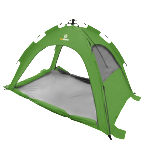 Since the tent entryways have been equipped with fine mesh mosquito nets, you will be well protected against pesky insects. With a pack size of 70 x 14 x 14 cm and a total weight of about 2.8 kg, the SunSnapper is very easy to transport. The four entries to the SunSnapper each have their own zip, so they can be opened and closed individually depending on the position of the sun and the direction of the wind. 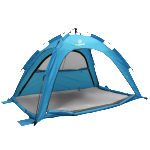 In addition, the beach tent has three windows and a door with a mosquito net. Annoying mosquitoes are thus completely held at bay from the tent interior and optimal ventilation is ensured. In addition to the high-quality fabric Lumotex 80, all other materials used by Outdoorer are also of the highest quality. The SBS-branded zips are particularly robust, the fibreglass poles are wind-resistant and the linkage mount and carrying bag are both made of robust Oxford polyester. 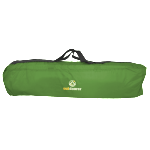 Where can you buy the SunSnapper by Outdoorer? 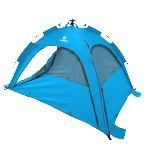 You can buy the SunSnapper sun tent in blue or green affordably and quickly via our Amazon store. Make your own experiences with the SunSnapper and let us know about them. We always look forward to opinions and reviews.